Is Something Bizarre Going On in Washington DC? Yes, it is. And though it's hot as Hades in Georgia lately, like you I am snowed under with news and propaganda concerning the purposefully manufactured debt-deal-crisis/default-threat now being waged for the cameras, microphones, and the public in Washington DC. Personally I am not impressed for in Politics, if it happens, it was meant to happen--almost without exception! And you know that impeaching President Obama is on their freaky take-over agenda. Now disruptive planet Uranus is always cast as the rebel, the revolutionary, the catalyst, the Genius, and the Awakener, right? Well, with Ebertin cluing us in to the hidden identity of Uranus when in Mars-ruled Aries--as it was during Hitler's rise to power--as 'Utopians', I believe Utopians of the secret society kind are now in progress of completing a total coup and collapse of the US government and US financial system in which Financial Collapse 2008 played its role. Will the American public be swayed toward the lesser of two evils--the Obama solution--to 'improve' our economic condition? How will the rest of the global economy behave if the US defaults on her legal debts and renegs on all the responsibilities which will have to be neglected because of Washington ideologues shoving their fanatic agenda onto our country? Most Washington politicians operate as the political arm of a larger globe-striding organization, I keep tellin' ya! Plus, one reason I'm posting the EU--NWO Flag chart here is for my own future reference and I hope any Astrology buff reading this post will take the chart into consideration especially with such precarious conditions now affecting the European financial system along with that of the United States, and the world. UPDATE August 3, 2011: economist Paul Krugman's NYT op-ed This Morning's Grim Eurothought is brief yet elucidating on the EU situation which is now being repeated from the past when financial crisis in Europe helped precipitate the 1929 Crash in the US. He makes this post's case! And a new study of the chart can shed light on the baked-in weaknesses now causing trouble in the EU and hamstringing efforts at financial improvement. OF course, a look at the natal chart of the EU itself is also instructive. Above, you see a noon chart for the European Union (EU)--slash 'NWO'--Flag Unfurled enterprise set for July 14, 1989 Brussels, Belgium. This was the 200th anniversary of the French Revolution's Bastille Day and was probably chosen for just this reason. Occult symbolism applies. Please enlarge the horoscope by clicking and perhaps you can read my chicken-scratch notes since blogging time is rather limited today for I have lots to do. As you see, tr Mars today conjoins 1989's Jupiter at MC which expands the part activist Mars is playing in events--monetary and social status may be improved if negative factors don't interfere; however, the temptation is to give people more credit than they deserve! Oddly enough, 1989's Moon @ 29Sco44 was conjoined by US Inaugural Moon 2009--we-the-people during Mr. Obama's presidential Oath Taking...'30Sco' = "A Halloween Jester", a Sabian Symbol with all sorts of implications including that of Grand Master Templar Jacques Demolay whose untimely death by execution long ago seems to be revenged ad nauseum even now and which is marked through history, as some folk say, by the unlucky 'Friday the 13th' superstition. As you see in 10th house, our current Solar Eclipse 9Can12 of July 1, 2011 is posited with its Cancerian emphases on democracy, power struggles, restrictions, inflexibility, money difficulties (conjunct US natal Sun and Jupiter), trade, commerce, and transport disturbances, real estate, food supplies and shortages (famine), homelessness, foreclosure, and refugee issues, and misfortune concerning buildings and property. Plus, Moon-ruled Cancer the Crab is the 'side-stepper'! On Capitol Hill, the GOP is all but giddy at the thought of the financial precipice America teeters upon as they implement their plan to "see Obama fail." And it seems that President Obama is walking right into the trap! Is he secretly on the side of these particular Utopians? Probably not. Others? Yes, or he wouldn't be in the White House. Yet these brigands hope to 'build anew upon the ashes' of our nation...remember The Phoenix was preferred by certain of America's founders to serve as our national symbol, and not the eagle. 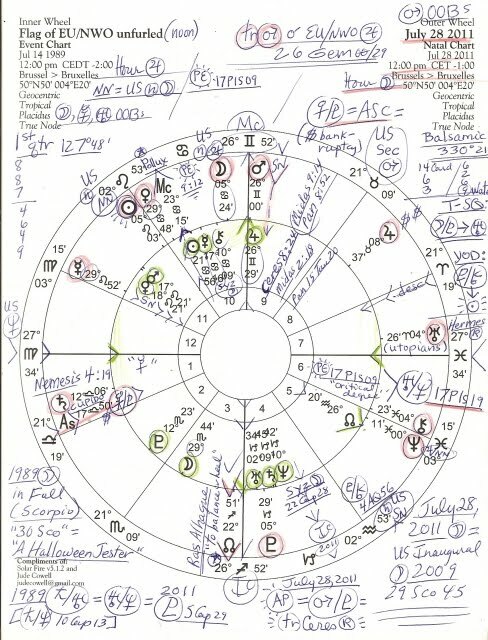 A synchronistic chart factor is a repeating midpoint--in early Aries on July 14, 1989, and on July 28, 2011 as well. 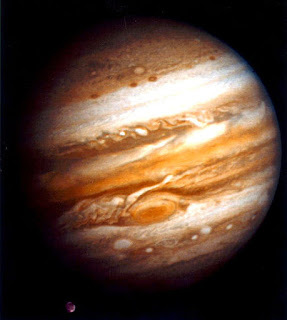 It involves the Jupiter/Neptune pair of inflationary practices, grand schemers, speculators, spendthrifts, and wastrels--and guess which planet sits upon its apex, then and now? Well, Mr. Boehner held a presser a while ago so I'll mosey along for now. Let me know if you wish to comment on-topic concerning this horoscope, or on the societal conditions now prevailing. If the GOP is allowed to set the timeline of the 'debt crisis' for December 2012--aka, the can down the road tactic to affect the 2012 election--Americans can go ahead and kiss their Merry Christmas 2011 good-bye. *Source for EU-NWO Flag Unfurling July 14, 1989: Nicholas Hagger's book The Syndicate: The Story of the Coming World Government which I highly recommend to those interested in uncovering such topics. A news note from Thom Hartmann's broadcast today: GE is moving its x-ray technology business to China so more US jobs will be disappearing. Besides undermining the American economy further, GE's move to Beijing also 'pokes a stick' in the President's eye--compliments of his reputed 'jobs czar', Mr. Immelt. 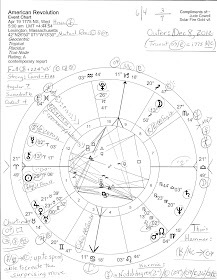 The 1989 chart's Pre-Natal Eclipse Series (PE) is at a critical or crisis degree, '17Pisces'. In July 2011, the transiting midpoint Of Uranus/Neptune is, as marked, @ 17Pis19 thus stimulating 1989's EU Flag Unfurling PE which is in the 9 New North Series: 'violence, great or sudden physical efforts and/or events; accidents; guarding one's safety.' (Brady.) 9NN last manifested on March 19, 2007 (George Bush!) @ '28Pisces' and will next occur in 2025. 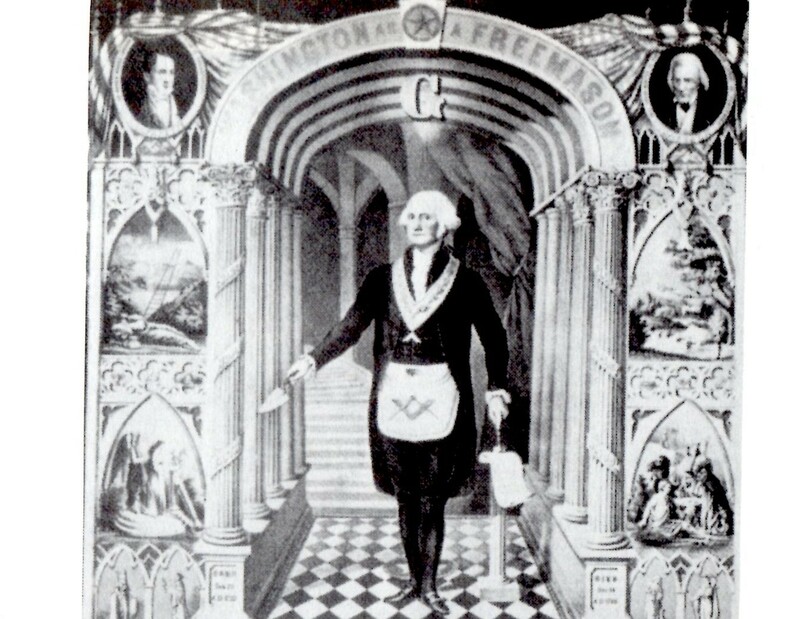 9NN is the PE of the WikiLeaks release of the US helipcopter carnage video, of Julian Assange himself (1971), of Abraham Lincoln (1809), Bobby Jindall (1971), of assassinated President Garfield's inauguration (1881), Edgar Alan Poe (1809), and the Generation of Materialism (Robber Barons, 1881)...aka, the Great Bubble Creators who now desert America where they first made their fortunes. My heartfelt condolences go to the good people of Norway for this would be the type of Uranus/Neptune paternalism the social freak on his political rampage wishes to shove upon the world with his 'awakening' massacre of defenseless teenagers in Norway on July 23, 2011--a 'New Knights Templar', as he styles his racist self. He's a Utopian similar to, and reading the works of, America's right-wing crazies who now intrigue to impeach President Obama and crash the US economy to make him look the culprit. Links of interest may be: Free Press and Conversations With Great Minds.